It’s been more than 19 months since the last 5% dip in the S&P 500 Index. That’s a new record. This is just the sixth time we’ve gone more than a year without a 5% correction. The previous record of 394 days ended in July 1996. That was at the beginning of one of the strongest bull markets in history. After that, the index gained 30% over the next seven months before the next pullback. A year after the streak ended, the index was 43.6% higher. Almost four years later, the bull market ultimately topped after the index gained more than 138%. Market strength after a strong run is not unusual. 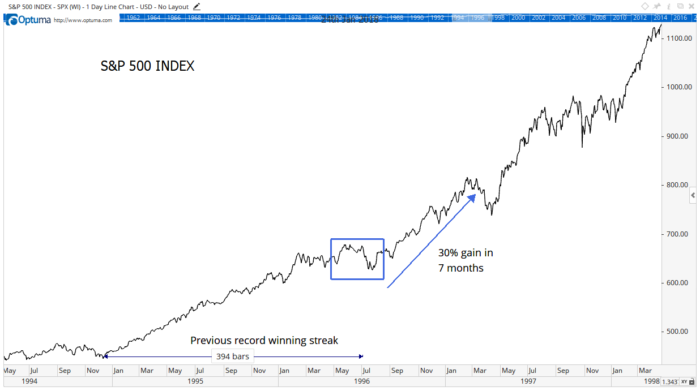 In fact, in four of the five times we saw a streak like this, the S&P 500 was higher a year after the streak ended. The only loss was a 6.7% decline in 1962. Now, these high valuations worry some of you. For example, the Shiller cyclically adjusted price-to-earnings ratio, or CAPE, is at 32 right now. It’s only been higher twice — before market crashes in 1929 and 2000. Well, in 1996, the CAPE ratio was at 25. It had only been higher once before, in 1929. In other words, skeptics worried about valuations in 1996 just as they do now. Those concerns were unfounded in 1996. Concerns might also be misplaced right now. This market is unusually strong, and it’s reasonable to worry about a pullback. But history tells us that most of the time, the pullback will be a buy signal rather than the beginning of a new bull market. Next »Where Did the January Effect Go?